Private newspapers are complaining once again and rightly so. Please don’t mistake me for being an enemy of our national language. In fact I have always been an ardent supporter of the idea that Dzongkha needs to be promoted, in my own capacity. Newspapers were forcefully made to carry out the burden of bringing out Dzongkha editions. When someone is forced to do something often the outcome is a poorly executed work. Some papers feel that it is financial burden to carry out the noble “responsibility”. In the first place, these so-called Dzongkha inserts are poorly written; rather poorly translated. They are printed in black and white; thereby rendering them less attractive. Photos are hardly visible. The quality is hardly up to the mark. 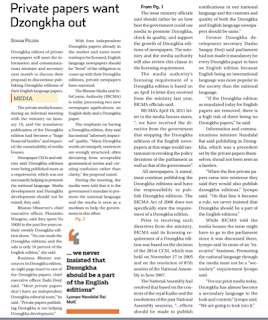 Just by printing a few pages of poorly translated Dzongkha inserts in English papers would contribute towards the promotion of our national language is a misguided notion. At the most it makes pokes fun at our language. It is a pity that our newspapers are made to do this. And now that we have Dzongkha papers, we should allow these papers do the honor. We should make every possible effort in providing them support and let's put to practice what is reflected in the policies. If we can render them adequate support then half the work is done. But right now, these Dzongkha papers are fighting in the market for their share of government advertisement money. 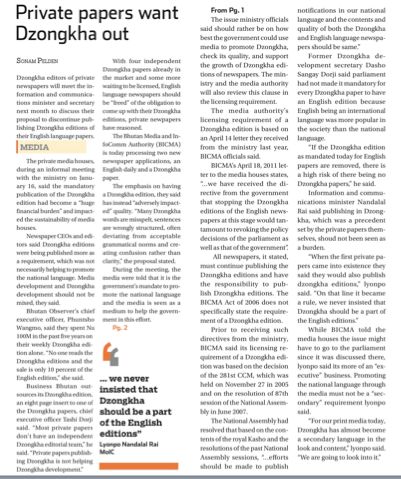 If we have a policy in place, then slowly more people would be interested to bring out Dzongkha papers in the country. And not under pressure. I think the concerned authority should really look into the matter and stop our newspapers from making fun of our national language. If in future these papers are develop the capacity then we should allow them to bring out independent Dzongkha papers. But please please say NO to these step-child like Dzongkha inserts. It is a joke. And it is a pure betrayal to our national language. Adopt some other practical and workable methods to promote it.